There is a link to educator resources in the horizontal menu at the very bottom of the screen. Lesson plans, teaching tips, and other web resources can be found in the educator resources section. A possible follow up activity is to have students convert English units into metric units. Students could also use this tool to consider typical emissions and lifestyle habits of people in different countries. 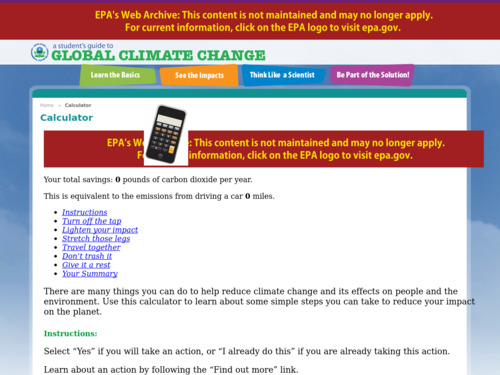 A nice resource from the EPA that complements the "Calculate your carbon footprint" calculator. This one converts current activities (and those the user will change) to pounds of carbon saved and expresses the result in terms of miles driven by cars. A quick exercise involving 16 activities like "Turn off the water when you brush your teeth," "Bike or walk to school instead of getting a ride," "Recycle newspaper," "Unplug chargers when they are not in use," "Enable the sleep feature on your computer," etc., gives savings for each activity as well as personal totals. Reduction of carbon emissions is translated into a carbon equivalency of miles driven in a car. Additionally, information on the basis of the calculations is given in "sources and assumptions" tab on the downloadable spreadsheet. Comments from expert scientist: The Carbon Calculator is a straightforward exercise that gives the user a clear understanding of the impact of individual and collective carbon choices. Assumptions behind each calculation are not specifically stated. This is a self-directed website designed primarily for middle and high school students. It could be used in both formal and informal educational contexts, including classrooms camps and after-school programs. Finding "sources and assumption" tabs at bottom of spreadsheet is somewhat difficult.